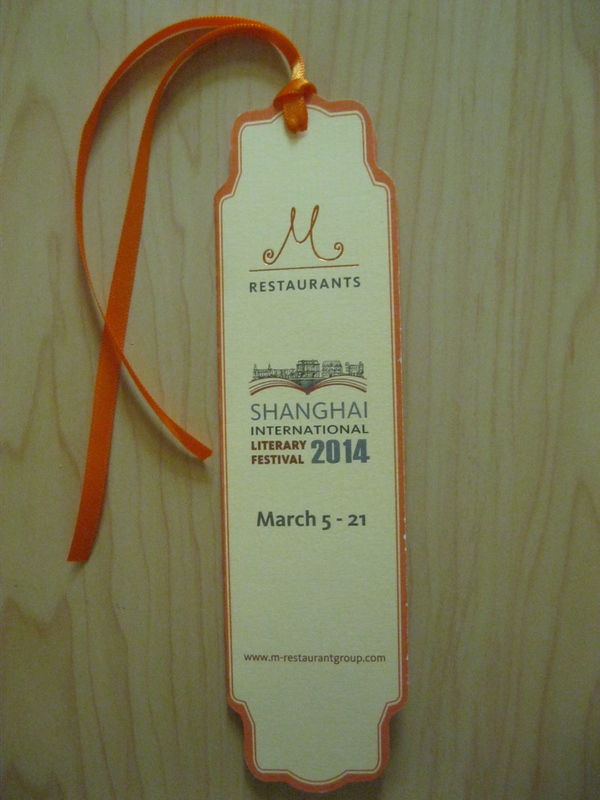 I’ve said it before and I’ll say it again: the Shanghai Litfest is one of the best things about living in the city. This is the third time I’ve been around to attend it, and I went to far more sessions this year than I ever have before. I can honestly say that I didn’t go to a single bad event—and a couple of them were even more excellent than I’d expected. 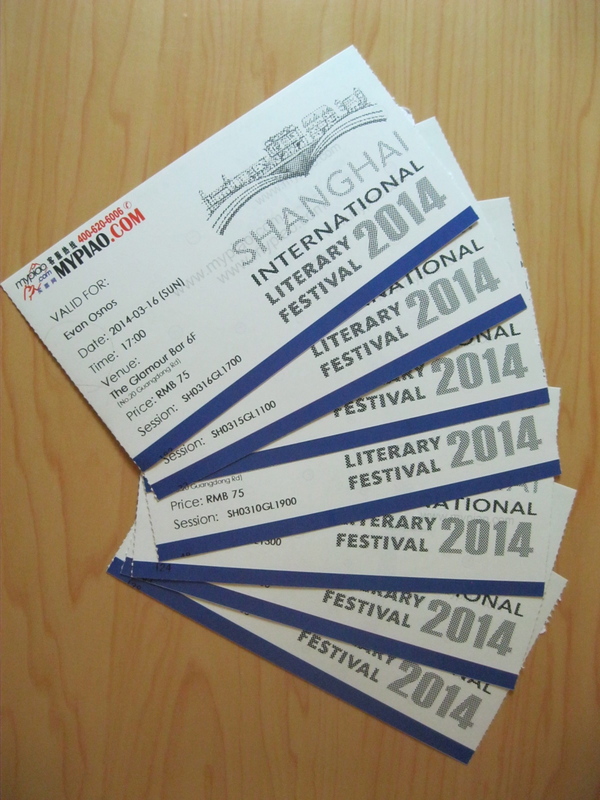 A week’s worth of Litfest tickets (almost—I seem to be missing a couple). After moderating Virginia Pye’s talk on the morning of Sunday, March 9, I hung around and caught Adam Minter’s session that afternoon. I’ve already mentioned how much I like his book, Junkyard Planet, and he gave a really good presentation on some of the trash-related topics that he has been investigating for more than a decade. Minter has done a huge book tour in the United States, Europe, Southeast Asia, and now China … I’m amazed he still has the energy to make his book talk seem fresh. The next night, I headed back down to M on the Bund to hear Steven Schwankert, a Beijing-based writer and scuba diver who recently published Poseidon: China’s Secret Salvage of Britain’s Lost Submarine. Schwankert’s book traces the history of the British submarine Poseidon, which was sunk off the coast of Shandong Province in 1931 and, unbeknownst to pretty much everyone, raised by the Chinese in the 1970s. I haven’t found time to pick up Schwankert’s book yet, but it’s on my never-ending list of things to read. Thursday night featured William Dalrymple speaking about his latest book, Return of a King: The Battle for Afghanistan, 1839-42. Dalrymple publishes prolifically, and while I’ve been meaning to work my way through his many writings on Indian history for years, I haven’t managed to find the time yet. His engaging talk was one of the two standouts at this year’s SILF for me—and I wasn’t the only person excited to hear him speak. The room was absolutely packed. On Saturday morning, NYU Shanghai professor Anna Greenspan presented on her forthcoming book, Shanghai Future: Modernity Remade, which considers Shanghai as a futuristic city. It sounds very cool, and my copy should be arriving soon. That’s going near the top of my to-read list for the summer. Saturday afternoon’s event was another family history-centered talk, this one by Emma Oxford, who has recently written up the story of her parents’ life in China during World War II. At Least We Lived describes how Oxford’s parents met at a tea party given by Song Meiling (Chiang Kai-shek’s wife) while both working in Chongqing (her mother for the intelligence service, her father in the military). Like Virginia Pye, Oxford has collected old letters and other family documents to help her piece together events that she knew little about and understand what life was like for foreigners in China before the founding of the PRC in 1949. The last session on Sunday was one I had been looking forward to all week—Evan Osnos giving a pre-publication talk about his book, Age of Ambition: Chasing Fortune, Truth, and Faith in the New China. 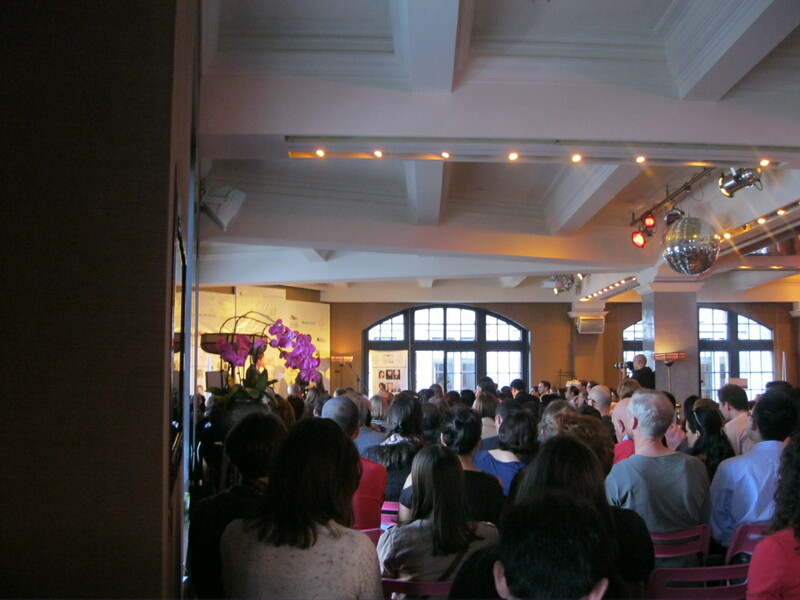 I wasn’t the only person eager to hear Osnos speak, as tickets had sold out several days earlier and the Glamour Bar was completely packed. He read a few excerpts from the book, all of which whetted my appetite for more. I can’t wait for my copy to arrive when Age of Ambition is published in May. How packed was Osnos’s talk? This was my view. He was behind the purple flower. Finally (finally! ), I attended a lunchtime panel on Monday that featured Jeff Wasserstrom (historian), Evan Osnos (journalist), and Mishi Saran (novelist) in conversation about different ways to write about China. Panels like this one can be either really good or painfully bad, depending on how the different personalities mix. Happily, the three people on stage got along perfectly well and seemed to be having fun as they compared war stories. So that was a pretty busy week (and that’s only the time I spent at the Litfest! ), but time very, very well spent. As always, I left the various Litfest sessions wishing that I had unlimited time to read and write—there’s really nothing more inspiring than hearing good writers talk about their work.